Articles→Breaking News→Owen’s Westside Store Closed Its Doors Thursday. Now What? Owen’s Westside Store Closed Its Doors Thursday. Now What? The Owen’s store at the corner of Market and Columbia Street in Warsaw closed its doors on Thursday. WARSAW — For some, it’s hard to argue that the closing of the old Owen’s on West Market Street in Warsaw creates a food desert since there is a bigger, newer version of the store just two miles to the east. 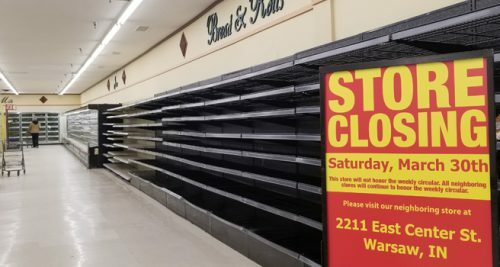 But with the closing of the westside Owen’s on Thursday, shoppers in that part of town have lost two longstanding options after Marsh closed its doors less than two years ago. The “old” Owens’ at the corner of Columbia and Market Streets closed a week earlier than planned Thursday as shoppers cleaned off the shelves in recent days, enticed by deep discounts of 50 and 75 percent on merchandise. Kroger’s, the parent company, announced the store closing on Feb. 27, saying it was not profitable. The decision comes after the company celebrated a $4.1 million renovation at its other store on Center Street. Abisha Gross said she was a regular customer of the older store when she lived in an apartment above MudLove a few blocks away. She liked the idea of walking to the store and said she’s continued to frequent the location since moving. She was at the old store Tuesday and picked up a Keurig coffeemaker for 75 percent off the regular price. But she still feels bad for its longtime customers. It’s not just a hardship for neighbors, though. Most shelves at the westside store were empty by Tuesday. The store closed Thursday. 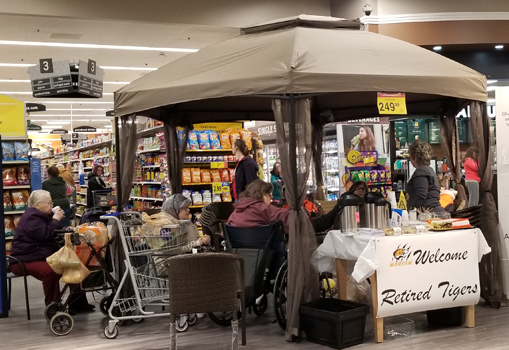 Others who live to the west of the city also liked the convenience because (except for a grocery store that just recently opened in Mentone) there are no grocery stores on the west side of Kosciusko County. Deb Dawson of Tippecanoe came to the store with a friend from Etna Green, looking for sales items Tuesday, but most of the shelves were already empty. “We used to come here a lot instead of the big one,” Dawson said. Some of the store’s most reliable customers were seniors who live at Retired Tigers apartments just a few blocks away. In response, Senior Services of Kosciusko County began a bus service this week that will take Retired Tigers residents and other seniors on the west side to the eastside store on Thursdays. They also plan to begin providing rides to Walmart, according to David Neff, executive director of the agency. Mayor Joe Thallemer agrees with others that the closing of Owen’s and Marsh have left the westside with no convenient options. Thallemer said he learned of the decision the same day everyone else did. He said he initially tried to have the company reconsider the decision, but was told the store had not been making a profit for many years. Thallemer said he’s trying to secure a commitment from Kroger that they that won’t exclude selling the property to another grocery company. He said he realizes the hardship it creates for some people who preferred and relied on the west-side store. “The focus now is on the control of the real estate and whether or not there will be any restrictions on the building,” Thallemer said. Representatives of the renovated Owen’s on Center Street made a concerted effort to welcome residents who used to shop at the westside store.